Don’t leave wine glasses at snout or tail level. Alcohol is a real problem for pets, and overactive tails could also knock over glasses. Keep cut flowers and centerpieces out of paw’s reach. Many of the most beautiful plants—such as lilies and mistletoe—are quite poisonous to pets. Potpourri also contains herbs and oils that can be toxic. Careful with the turkey & trimmings! 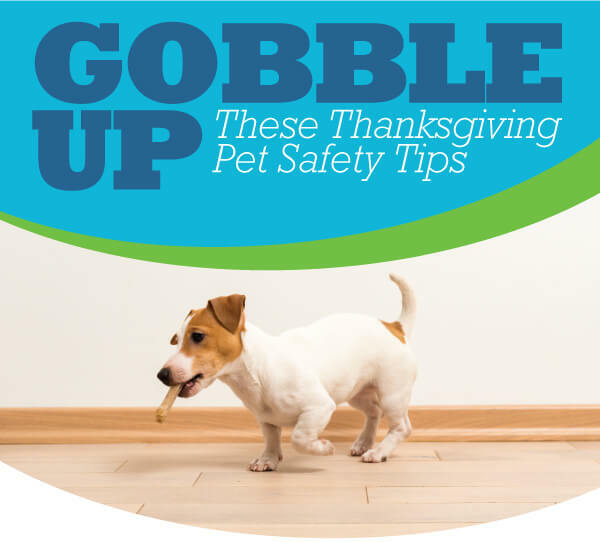 Turkey skin, gravy, and drippings are all high in fat and can cause pancreatitis in pets. Bones are a choking hazard, as is the tasty twine you used to secure your bird. If your stuffing contains raisins, onion, garlic, nutmeg, nuts, butter, or mushrooms, it’s a no-no for fido – and felines, too. You’re probably already aware that chocolate—especially dark and baking chocolate—can be toxic to pets, but it should be paws off for other sweets and rich desserts, too. Have a happy and (pet-safe) Thanksgiving!